Nokia's stock price crashed by over 10% on mixed Q1 2013 results. Nokia's Lumia range finally seemed to be picking up some traction, with 5.6 million shipments, but this was offset by Symbian shipments dropping to just 0.5 million. However, Nokia's feature phone business seems to be collapsing, showing a 30% sequential decline and a 21% annual decline. 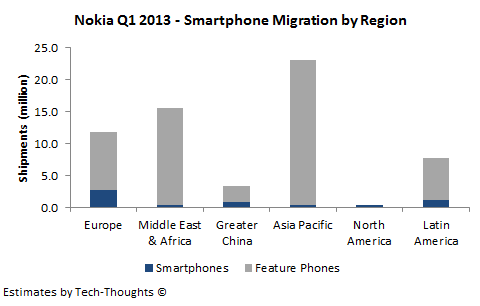 Using Nokia's announced figures, let's attempt to estimate their smartphone and feature phone shipments by region and gauge their smartphone migration efforts. The performance of Nokia's Lumia portfolio was far above my expectations, as it showed 27% sequential growth with a modest sequential decline in ASP (to €182). 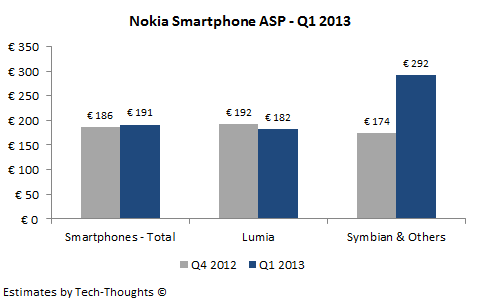 Overall smartphone ASP still showed growth (to €191), as Symbian shipments were limited to high-end models (such as the 808 Pureview). Interestingly, Nokia's has projected Lumia shipments for Q2 to be above 7 million. Given the launch of the Samsung Galaxy S4, the HTC One and the continued onslaught of cheap Android devices, I would expect heavy discounts in the coming months as Nokia attempts to hit that figure. Meanwhile, Nokia's feature phone portfolio crashed to just 55.8 million shipments and the ASP declined to just €28. As I had predicted, shipments of Nokia's full touch Asha portfolio crashed by nearly 50%, thanks to low-end Android competition in emerging markets. Nokia's quarterly results include the region-wise performance of its "Devices & Services" division, which includes both smartphones and feature phones. The region-wise data includes revenue, total shipments and overall ASP. Unfortunately, it does not provide a break-up of shipments between smartphones and feature phones, but using the inputs above, we estimate those figures. The first step in this estimate would be to create a rough region-wise smartphone & feature phone shipment estimate, by using the global average smartphone and feature phone ASP with the region-wise revenue. However, since the actual ASP by region is likely to vary, this would give us a figure for total smartphone & feature phone shipments that are inconsistent with the announced figures. At this point, we can find a "best fit", i.e. optimal solution, which gives us region-wise shipments that match the total shipment figures (with the region-wise ASP being the closest possible fit with the global ASP for smartphones and feature phones respectively). The figures above seem to be consistent with Kantar's recent market share figures and Tomi Ahonen's thoughts. Nearly 50% of Nokia's smartphone sales seem to be from Europe, declining from more than 60% in Q4 (which I assume is Symbian-driven). The only other broad market in which the Lumia portfolio seems to have a significant presence is Latin America (~20% of Nokia's smartphone shipments). These markets and the ASP suggest that it is the mid-range Lumia portfolio that is driving shipment volumes. The Lumia portfolio seems to have a very limited presence in China and the Asia-Pacific (apart from North America). While Nokia's shipments in China constitute roughly 15% of its total smartphone shipments, the size of that market implies that Nokia has an insignificant presence. This tells me that the Lumia portfolio is very weak in regions where low-end Android vendors have a strong presence. This means that any expansion efforts by Chinese vendors like Huawei, ZTE & Lenovo could be particularly dangerous for Nokia. The chart above should be very disturbing for Nokia's investors. The proportion of Nokia's smartphone shipments, out of total shipments, is considerably lower than most estimates of the average smartphone penetration rate in every single region (except North America). This means that Nokia is probably losing a major chunk of its feature phone customers to competing smartphone platforms. Even if the Lumia business shows sustainable growth, the loss of Nokia's feature phone business should be a major blow to any hopes of achieving long-term financial stability. Why would you buy a nokia phone now? there is no reason, crap hardware all outsourced chinese crap and crap windows, really , you want windows on your phone? Last i looked everyone wants Android. get lost windows rubbish. Windows Phone is a loosing platform. If Nokia doesn't switch to Android or back to MeeGo, they will simply die. I think MeeGo ship is long gone and there is no feasible go back (it has not been developed any further for like a year now; Nokia has lost all the know-how; Nokia has lost the trust from its partners around MeeGo development; MeeGo has been discredited by Nokia management). So what are the reasons for increased Lumia sales in a slow quarter like this? My guess is that in few price ranges Lumias are priced very competitively and actually offer better value per dollar - at least for people that don't mind Windows Phone OS. I'm most familiar with Polish market (but from what I checked it doesn't differ much from rest of the Europe) and here Lumia prices (precisely Lumia 610) starts between cheapest HVGA Android devices and Android WVGA devices (at around 140 euro). So it's not surpising that Lumia phones steal sales from cheap Android WVGA devices (mainly Sony Xperia J and U, Galaxy Ace 2 and Duos, LG L7) as they offer both better price and often better performance (ARM Cortex A5 that is found in most Androids in this price range is to blame). What's more Nokia Lumia 800 aren't much pricier and are with direct price competition with cheap Android WVGA devices. Lumia 800 may have its faults but its AMOLED screen and high-end camera are unmatched in this price category. It may not be the newest device and comes with old Windows Phone version but cheap Android handsets also don't ship with Android 4.2 and have little hope for updates. Lumia 520 (with IPS screen and dual-core Krait) and 710 are also prices very aggressively and offer great value for cheap price. The obvious question is how can Nokia afford the low prices on Lumia devices (much lower than LG or Sony and those companies also are close to breaking-even)? Nokia isn't losing too much money anymore (Devices and Services posted only 42 million euro loss in q1). Perhaps they are just financing the situation with 250 million USD from contract with Microsoft and revenues from dumbphones? Or maybe thy are able to achieve better prices for components thanks to high volume (they still ship much more devices than any of its competitors beside Samsung) or are someway more efficient in manufacturing? The other question is if and when will Android be able to challenge Nokia sub-200 euro segment. So what are the reasons for increased Lumia sales in the slow first quarter? From what I've seen low-end Lumias are actually priced very aggressively compared to Android WVGA devices and offer better value per price. In Poland (and from what I check it's not much different in rest of Europe) Lumias prices starts between cheapest Android HVGA and cheapest Android WVGA devices (precisely Lumia 610 starts at around 140 euro). For me it's not surprising that in this price range many people (at least if they don't mind Windows Phone) will choose Lumia 610 over Androids as Lumia offers both better price and often better performance (ARM Cortex A5 found in many cheap WVGA Androids like Xperia J, Galaxy Duos or LG L7 is to blame). What's more Lumia 800 is also priced comparatively to cheap Android WVGA handset. It may not be the newest device and ships with older Windows version but its AMOLED screen and high-end camera are unmatched in this price category. Lumia 710 and 520 (with 4'' IPS screen and dual-core Krait) are also priced very competitively and generate deserved interest from customers. Their more high-end devices seems to present much less appealing offer but devices mentioned above should be enough to secure meaningful part of smartphone market share and the shipments may grow further. The obvious question is how can Nokia afford to sell smartphones much cheaper than let's say LG and Sony (and those company aren't making much money in handset segment also, I leave Samsung from comparison as it may well have sensible margin even on mid-end droids) and still be able to only post minimal loses (Devices and Services posted 42 million euro loses in last quarter). Are they financing this of their dumbphone business and contract with Microsoft? Or are they getting better prices on components thanks to volumes (they're still shipping over 60 millions devices each quarter, much more than all its competitors beside Samsung) or are more efficient in some other way? Another question is if and when will Android be able to match cheap Lumia both in price and performance (Cortex A5 devices may not be enough). Seems like I have posted twice about the same thing. This post didn't show up at first so I thought it got lost and I wrote pretty much the same thing again. Sorry for that (mods can delete the post I'm replaying to). Same could apply to Android. That also needs know how, partners, trust and the management discredits Android ever since then. So much for keeping options rather then burning them. Management ABC. 1/3 of the sold devices are WP7. Dropped far under price. That's not a healthy long-term strategy. There dumpphone business collapses incredible fast and even those $250m can't compensate enough. Even more so since the Nokia/Microsoft compensation/licensefees money flow list shifting over contract period. Microsoft has to pay lesser/gets more as time passes. Those payments pay time but for how much longer? Yes, I want Windows on my phone. That's what I'm wondering if it's sustainable and for how long. But I guess as long MS is interested in paying them and the volumes won't go above 5 million they may be able to 'donate' up to 50 USD per device which would make those devices a steal. But they do say they expect 7 million next quarter. Because their cheap? And surely Nokia 800 isn't crap hardware for the price Nokia asks for this device. First of all Tomi Ahonen is a notable hater and liar, it would be better if you stop referencing him, or your article will lose credence. Second, you have missed certain things. Q4 is generally a bumper quarter for smartphone sales. The reason is holiday season. Check total smartphone sales, they have barely increased in q1 if not decreased. The only contradiction is the Chinese new year. So generally you can expect q1 sales to be low. For comparison, Apple reported 37m iPhone sales versus 47 million last quarter. This is the reason for the fall in smartphone sales in US and Europe, absolutely no reason to panic. 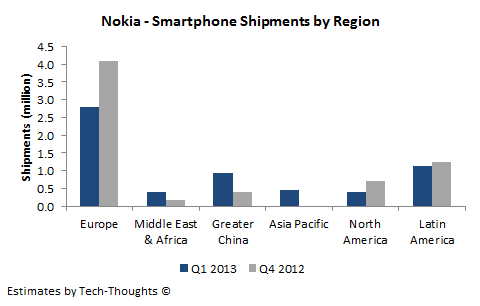 Nokia's smartphone portfolio gained in Asia Pacific, Greater China and Africa/middle east. These are the regions where the holiday season is different or has no effect. As far as feature phone are concerned, the ashas are old, we probably should give them one more chance. I don't have many hopes, they must get ultra lower end WPs. And who will manage the cost of maintaining MeeGo, you? MeeGo is a DEAD platform, accept it. Lying or crying won't help and no,Nokia won't die. IPhone also has outsourced Chinese crap so has most androids. You want buggy androids, go for it, you deserve it. First, it's perfectly reasonable to reference anyone who has made correct predictions. I will leave judgements upto others. Second, regarding Nokia's smartphone portfolio, I was referring to the overall state of their efforts in each region and not their sequential growth (which has been quite good in any case). Third, the Ashas aren't "old", they were launched a few quarters ago. The feature phone market is essentially being cannibalized by low end Android devices, and the regions in which this is happening is particularly interesting. Looking at Microsoft's hardware requirements, the Lumia portfolio is unlikely to be competitively priced to make up for the loss of the feature phone portfolio and that's a major financial hit. Correct predictions? Tell me when has he made correct predictions? He said, Nokia's sales in q2 were peak and there is no way they could go up again. In q4 they went up. He said Nokia would post loss in q4, they posted profit. He said Nokia would sell less than 3 million Lumias and over 4 million symbians, reverse happened. He said Nokia is dead already (see his article on smartphone predictions this year), is Nokia dead? If so why this article. He said WP will get suddenly cancelled this year. Do you see that happening. We have GDR2, GDR3 and Windows Blue coming. He said nokia expected 1:1 sales on their transition from Symbian to WP, Nokia never said or expected that. He is a hater and a liar who makes up things and then gets his face spat at. A few quarters is old in today's world. HTC One X was sold just a few quarters before Butterfly, 900 was sold only for a few quarters, Galaxy Note 2 was sold two quarters back. In feature phone world, it is more relevant, because of the widening gap between smartphones and them. See, in q4 they sold an unbelievable 9.3m ashas, up from 6.5m. And now they crash to 5m. Clearly they would not have risen if low end androids are cannibalizing them. Nevertheless as I said I am not very hopeful of Ashas, as the feature phone market itself is dying. Microsoft's hardware requirements are definitely high for low end, but Nokia can still go lower. Flash memory for example is expensive and they can manage a 4gb device. Display size is another measure, Samsung still makes sub 3 inch phones. They cannot dig much deep, but remember that the market itself inflates as people get more affordable. Nokia won't post 10m+ lumia sales, but the 7m looks very reasonable to me. Look, you clearly dislike Tomi for whatever reason, and you're entitled to your opinion. I asked him about his estimates for this quarter and they were exactly in like with the results. That deserved quoting (and if you had clicked on the link, you might have realized this). Any correct or incorrect predictions unrelated to this quarter are immaterial with respect to this post. Acknowledge it and move on. A few quarters is old when you have newer flagships coming out. We're talking about the feature phone market where a few quarters is NOT old. The low-end market is driven on price and capabilities, NOT product launches. The high sales volume on launch was because of the relatively unprecedented marketing allocation for a low-end product. Crashed back to earth after that was done. The numbers speak for themselves, the overall feature phone numbers are the lowest in years. I'm not sure you're looking at the same figures everyone else is. As far as I know, screen size is specified in Microsoft's hardware requirements. At this point, nokia can only go lower when component prices drop. And all this while, ASPs are coming down much faster. The 7m is possible, but I suspect we'll see significant price discounting to hit it. The ASP should decline next quarter. "After the Chinese and APAC and Mid-east smartphone markets were destroyed by Elop, and US never recovered, its mainly Europe" This is a prediction? Fine, leave it. Galaxy Y has a 2mp camera, xperia tipo has 3.2mp. Minimum RAM requirement is 512MB. I think the only expensive part is dual core processor. As for ASP coming down, they will come down for a different reason. In this quarter, they will see mid range phones in action compared to 920/820 last time. While I agree with lower end going on price, I think advertising a new launch still helps. However as I already told you, I'm not counting much on Ashas. The feature phone market won't survive for long. The hardware requirements clearly mention a WVGA (800x480) resolution. It is difficult to include that resolution on a smaller display as procurement becomes difficult. First time I read this blog but not the last. One of the best analysis that I have seen recently and inline with my geographical estimates. However, the conclusions may be premature. 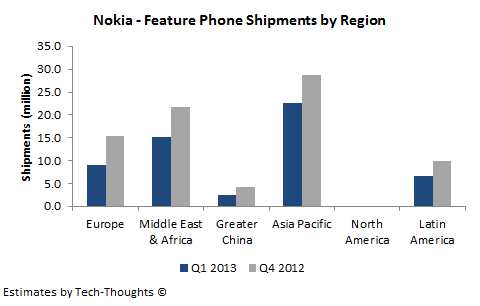 First of all, Nokia WP7.5 generation of devices was really not there for much of emerging markets. Both due to limited geographical availability and limited language support. Former gets better all the time and latter was greatly improved with WP8. could be debated. With WP8 the story is becoming quite different, 520 / 620 (some early sigs in 720) seem to have excellent traction on emerging markets (India included). Also the reviews are positive. thing is to get enough market share. 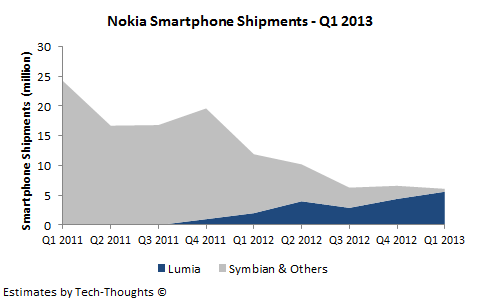 It is slow to drive up the volumes for Lumia, Nokia is now 2nd tier customer to component manufacturers. Nokia actually made a bold promise for the 2nd quarter concerning the volumes.This shows very good confidence on the product portfolio and on the early signs for the reception of the new devices. Relatively small increases in Lumia volumes will compensate for big drops in feature phone volumes (say 1 million Lumia / 5 million feature phones). So Windows is not buggy ? Good points, agree with most. The key is to sustain smartphone growth in a highly competitive and rapidly commoditized environment while the feature phone market shrinks. And I'm personally not a fan of log scale charts for the data presented in this particular post. Very easy to misunderstand. Log charts normally work really well for really long time horizons. No, I'm not. I have not lied about anything, if you feel I have made up things, I can give you links to justify. I have not talked about anyone there except Tomi Ahonen and I have stated why. If you visit his blog or twitter account and way he present things, you will agree with me. Quite fine, I take my words back, he was correct with the predictions this time. That was a more civilized response from him. I'm not sure with the WVGA part, although you seem right. Whatever, there can be a smaller specd phone. Not as much as android. Ask anyone. Here in Northern Europe, in Q2 2012 Nokia 800 was on sale for pretty much same price as Galaxy S2, HTC One S and Xperia P. All 3 vastly superior phones both spec wise and popularity wise. Nokia 800 is relegated to people who wanted to try something different for a few weeks/months and then sell it to get back to iOS or Android device. Prices for second hand Lumia series are rock bottom. Months old Lumia phones sell for similar prices as 2-3 year old android flagships. Hell even Nokia 404 sells better than Lumia 800/900. Seems like 70% of world population using smartphones has indeed decided to go for "buggy androids". While only ~2% have gone for this supposedly superior Windows phone.